Allan Rock's bid for the Liberal leadership will be lucky to survive his latest foul-up. On December 3, Canadian Auditor General Sheila Fraser revealed that the controversial firearms registry has been disastrously mismanaged from the very start by the justice ministry. Mr. Rock, a former justice minister and the leading leftist contender to succeed Prime Minister Jean Chretien, immediately came under assault from many directions, including previous sympathizers. In response, the Toronto lawyer claimed that the firearms-licensing project has been "saving lives." Leading the Rock hunt is Benoit Serre, a Liberal backbench MP from northern Ontario who is now calling for the industry minister's resignation. Mr. Serre claims to have told Mr, Rock in 1995 that the gun registry could cost close to a billion dollars. "He's the one that was told by caucus members, and he's the one that did not listen to caucus members. Bottom line: he created a monumental fiasco of $1 billion," the frustrated backbencher complains. "Think of it. That's a thousand millions. How many hospitals could we have built with that? How many doctors? How many nurses? How many schools? So it's a fiasco." Mr. Rock objects that his critics are motivated to trash him because of leadership politics. Counters Mr. Serre: "If he wants to say it's a leadership issue, then certainly I'll go with that and tell Canadians how incompetent he would be as prime minister." Media commentators were no less harsh. On December 5, Chantal Herbert, who works for the leftist Toronto Star, told a CBC national news audience, "Frankly, Mr. Rock's leadership aspirations took enough of a hit with the gun registration, and he was so far back already that nobody needs to worry and sit in a back room to kill him. It's like one of my colleagues put it not very nicely, putting a knife into a dead body." One member of the parliamentary press corps, who asked not to be identified, suggests, "[Mr.] Rock has been faltering for sometime. He seems to be accident-prone. Consider the Airbus lawsuit with Brian Mulroney, the hepatitis compensation controversy and the Apotex drug purchase. It seems he has the reverse Midas touch. Everything he touches turns to dirt." Canadian Alliance MP James Rajotte is the industry minister's opposite number in Parliament. "I know Mr. Rock says this is about leadership politics, but I think it's more about frustration. It's a question of ministerial and managerial competence. Look at the multibillion-dollar Technology Partnerships program. Only 2% has been returned of what's been loaned out. It's not simply a case of him being in the wrong place at the wrong time. The firearms registry is only the latest example. The fact is, he didn't deliver with some sort of fiscal probity." to refuse to be held accountable." Denied more cash, how can Ottawa fund its controversial firearms licensing program? 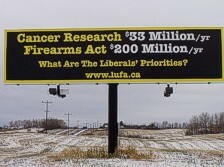 The Website of LUFA (Law-abiding Unregistered Firearms Association  "25,000+ Members and over 5 million unlicenced supporters!") LUFA constructed a new tourist attraction on Highway 16A West, near Edmonton (Stony Plain), thereby commencing its National Billboard Campaign. Their website is full of very interesting and well-documented facts about the federal gun registry fiasco that you are not very likely to find reported in the Liberally-dominated and -controlled major daily papers or on TV channels funded through the federal government and promoting federal gun registry advertising.